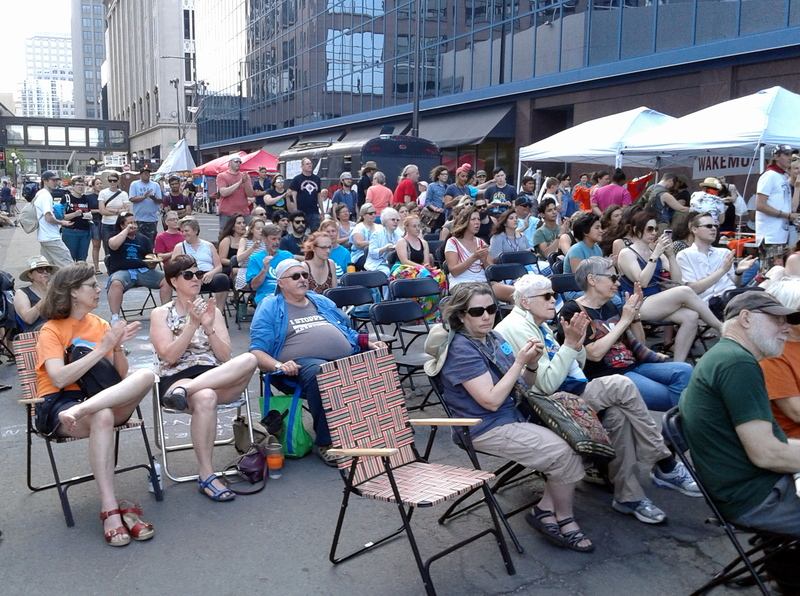 The event started at the Minnesota State Capitol, then participants walked to the PUC to start the Block Party. 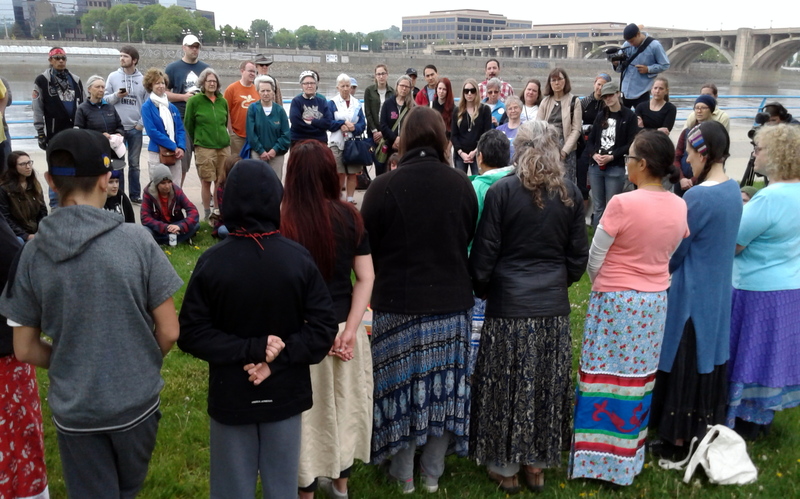 The event started Friday at the State Capitol, where participants gathered on the Capitol steps to meet with Dayton’s staff. Minnesota was in the last days of its legislative session and participants pushed the Governor’s representatives to veto damaging legislation heading to his desk. 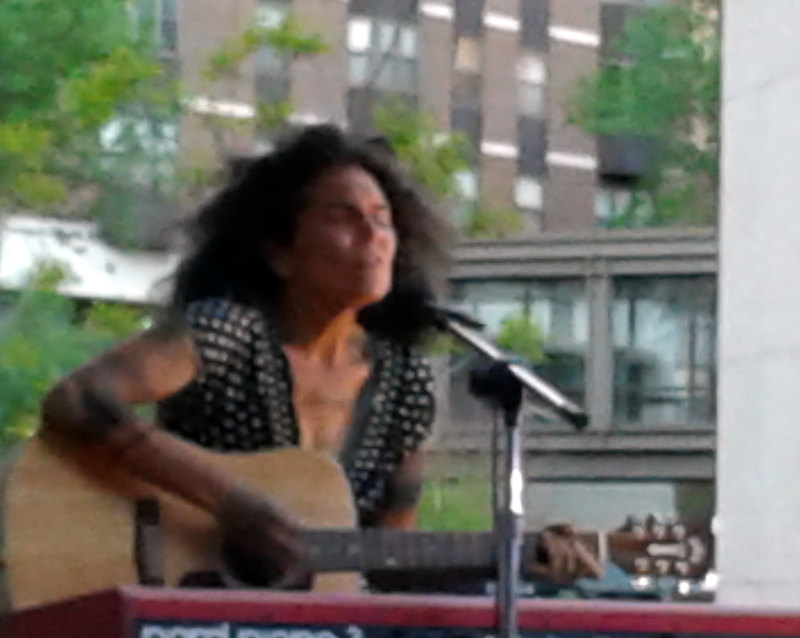 Annie Humphrey (Ojibwe) headlined the music concert. One bill would legislatively approve Line 3 without conditions, this after the PUC has been reviewing the project for years, after the public has committed countless hours in stopping this project — and with the PUC only a month away from a decision. 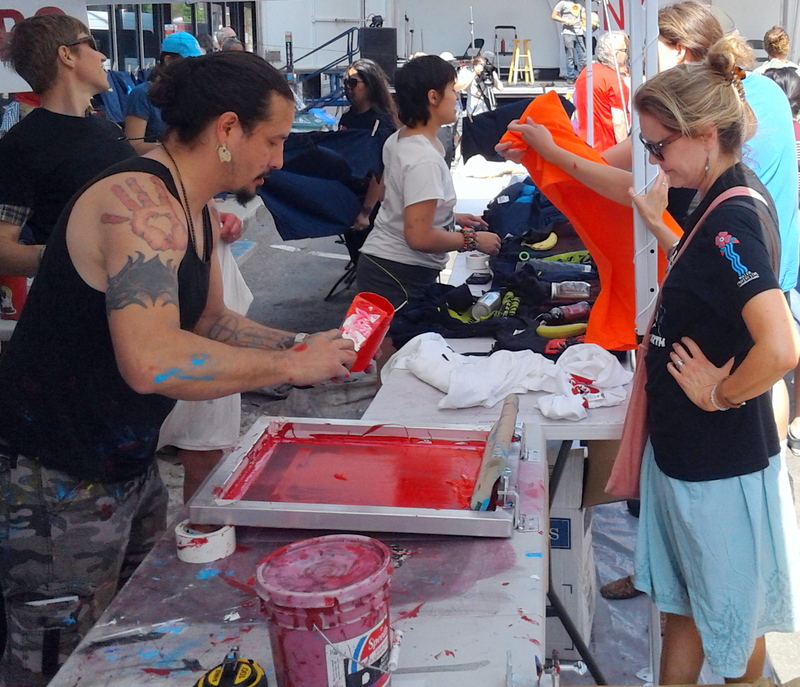 Rory Wakemup and the silk screening operation. 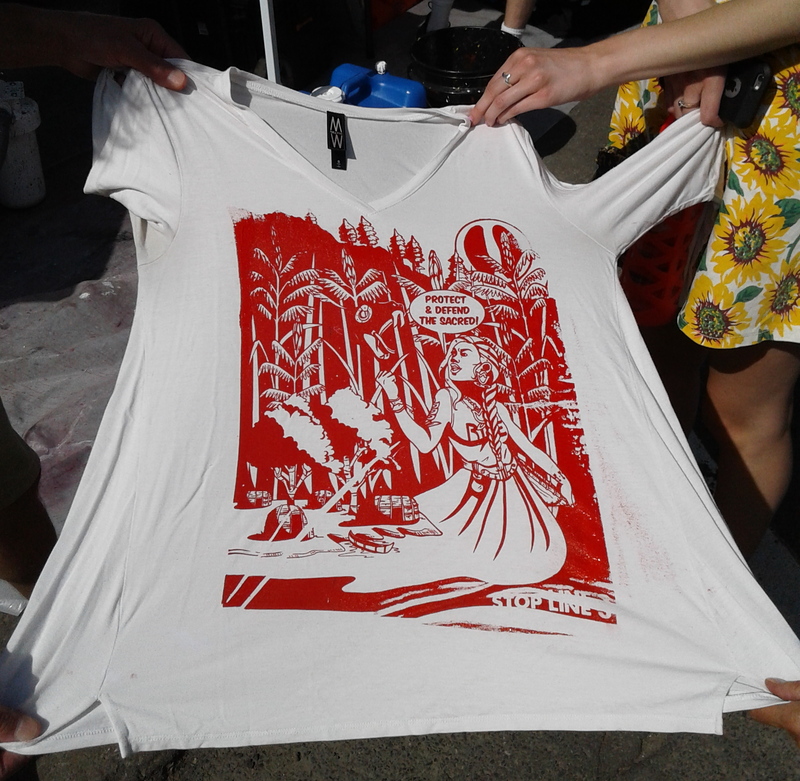 Rory Wakemup, a silk screen artist, set up a tent where people could bring their own t-shirts and get them printed with one of several different anti-pipeline designs. 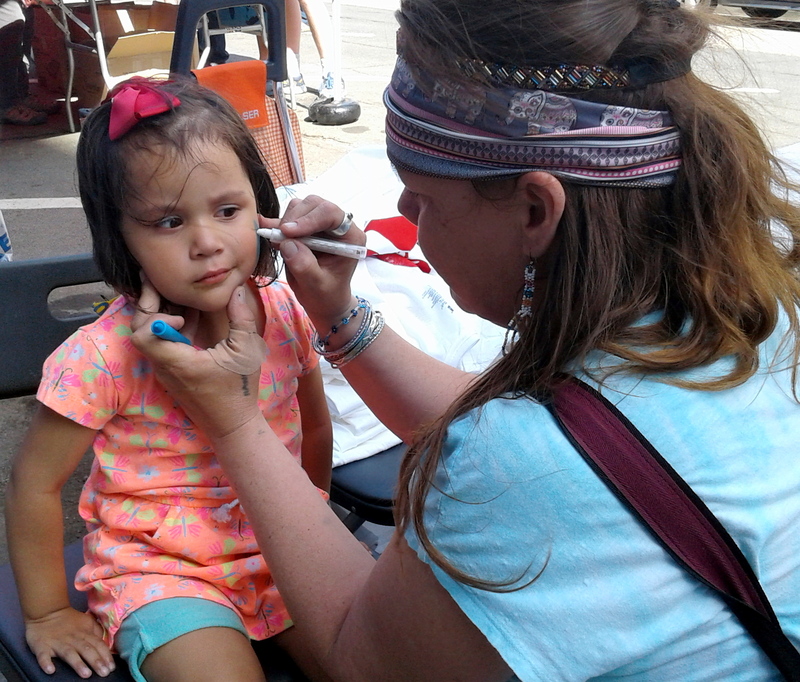 Other volunteers did face painting for kids. Still others enjoyed playing with sidewalk chalk. This event needed to be both a party and a protest. People have engaged in this work for a long time and sometimes you just need to celebrate together. With the final vote looming, people also needed to get re-energized and ready for whatever comes next. Here are just some of the reasons that people continue to step up to this issue. 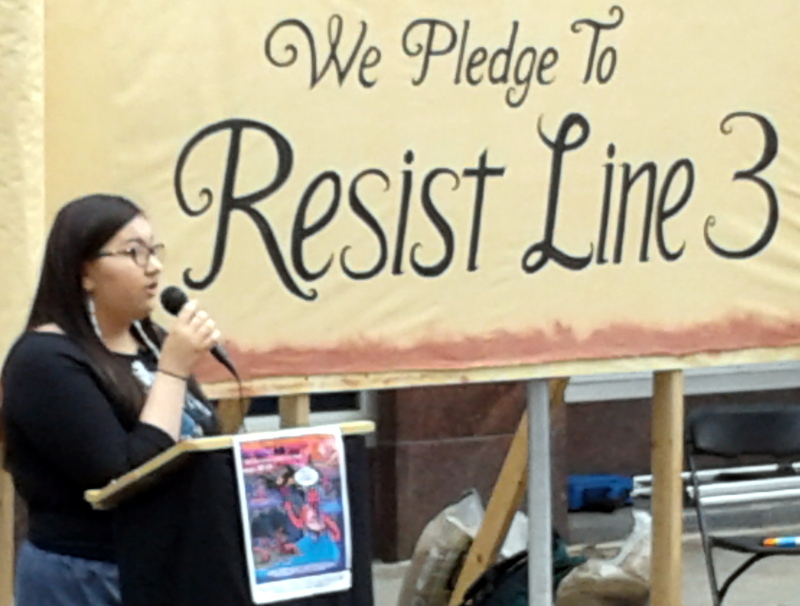 Youth leadership has been one of the hallmarks of the Line 3 opposition. 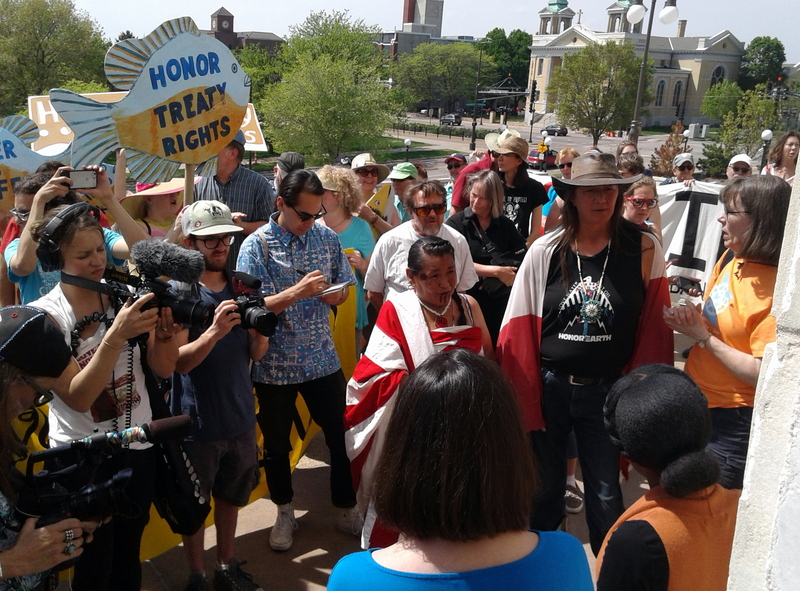 The process recognized the “Youth Climate Intervenors” as one of the official groups to participated in the quasi-judicial process of the pipeline review. It recognizes that the youth of today will bear the biggest burden of whatever decision is made, and the resulting pipeline spills, climate change, and other damage. A number of the Youth Climate Intervenors attended and participated in the event, including Rose Whipple, Akilah Sanders-Reed, Brent Murcia, and Sophia Manolis. Sharon Day, the Water Walker, noted that Line 3 is not the only threat to our water, and perhaps not even the gravest threat. Phosphorous and other contaminants are leaking into the groundwater every day. Yet we only have so much freshwater — and water is life. There is no reason to add risks to Minnesota such as Enbridge’s major 2010 pipeline spill into the Kalamazoo River. We are making progress in reducing fossil fuel demand and increasing renewable energy resources. This country has a long history of breaking its treaty promises with indigenous peoples. Line 3 seems to be no exception. 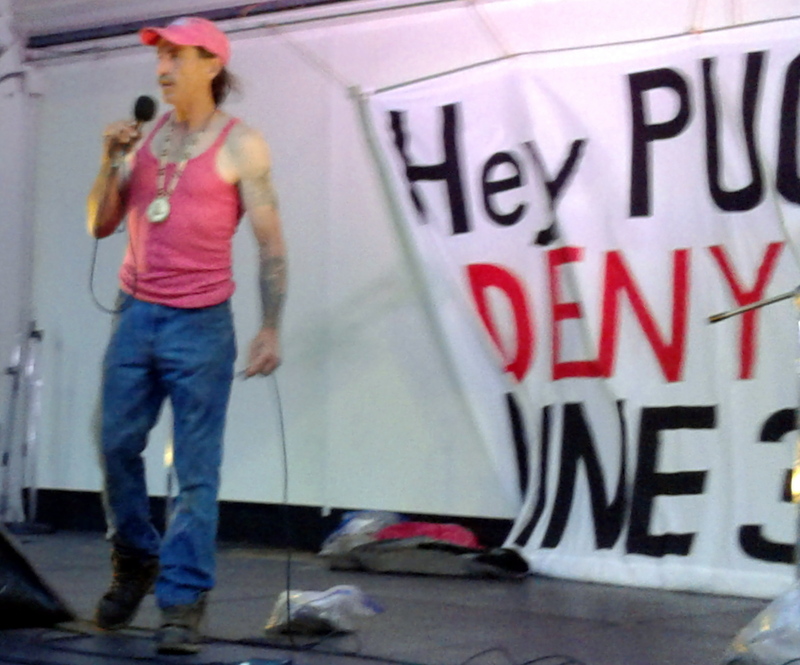 The PUC process has not taken treaty rights seriously. Neither the Environmental Impact Statement nor the Administrative Law Judge (ALJ) report on Line 3 has taken a position on whether this proposal needs to take seriously Ojibwe treaty rights to hunt, fish and gather on large areas of northern Minnesota that the pipeline crosses. It is avoiding responsibility and putting the burden on the Ojibwe to sue. Public opposition to this project is massive. Sanders-Reed told the crowd that of the more than 72,000 public comments filed on Line 3, more than 68,000 were opposed to the project, or 94 percent! 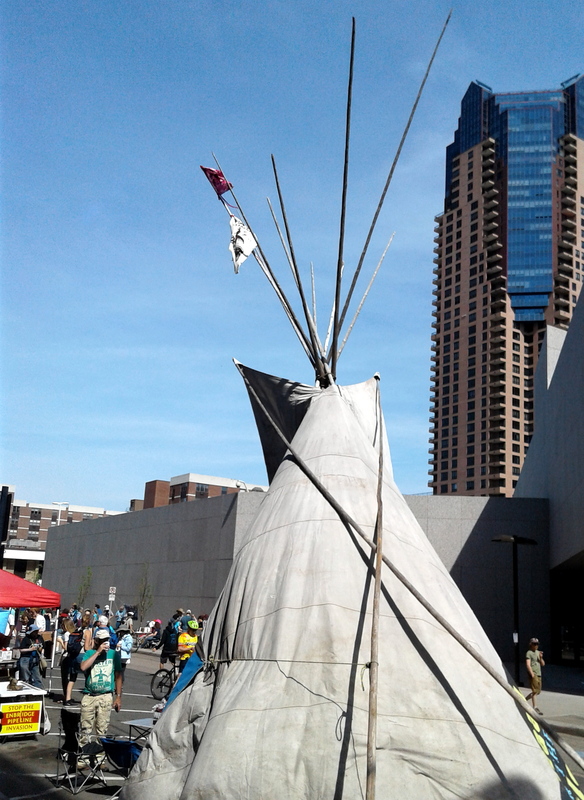 This has been a learning process spanning several years for Water Protectors and other Minnesota citizens opposed to the pipeline. They have had to learn and follow a complex regulatory process, a process that gives foreign corporations undue influence. Pipeline opponents have had to push back on corporate-backed proposals that would circumvent the process. 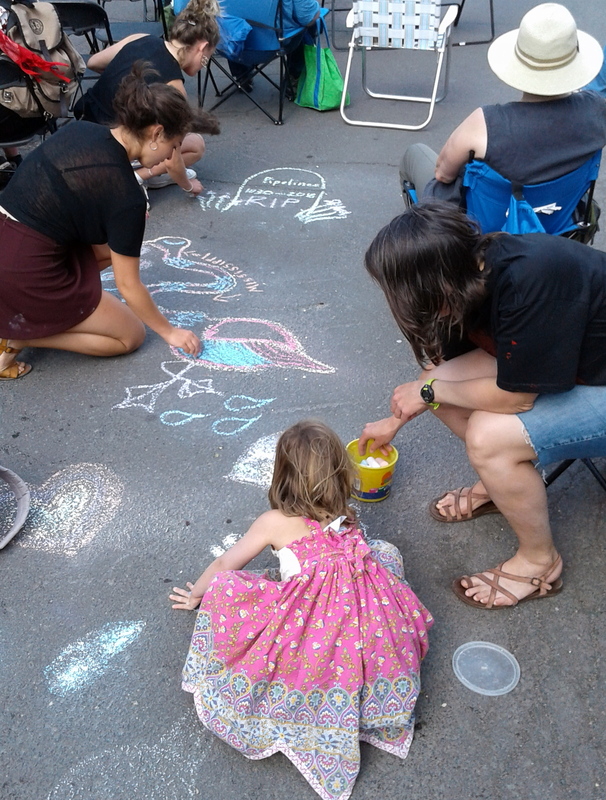 Block Party artists at work. Among the disturbing findings in the project’s environmental impact statement is the fact that Line 3’s “social cost of carbon” are estimated at $287 billion over 30 years. That’s an extraordinary cost that Enbridge is shifting onto future generations. Block Party organizers included: Stop Line 3, Youth Climate Intervenors, Honor the Earth, MN 350, the Sierra Club North Star Chapter, the Powershift Network and Minnesota Interfaith Power & Light. Other partnering organizations were the Facilitating Racial Equity Collaborative and Healing Minnesota Stories. 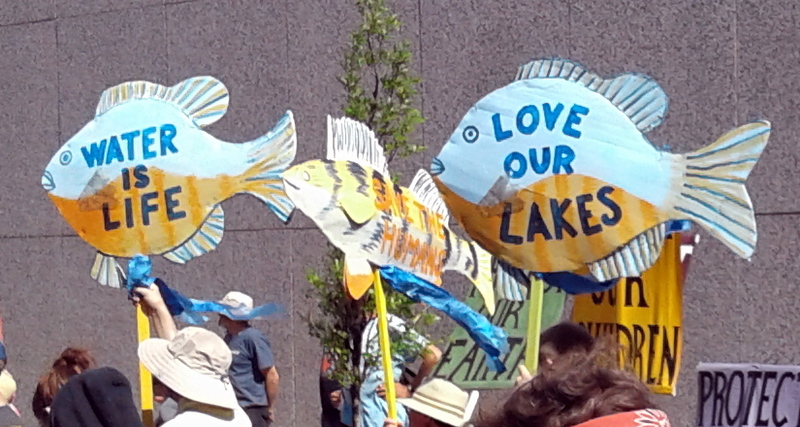 ← PUC Sets Line 3 Deliberation Dates; Come to Block (Line 3) Party This Weekend!